Welcome to the place where I share my passion for all things food. Mouth-watering recipes,visually delicious images, creative inspiration, and gorgeous accoutrement; some are mine, some belong to others, some are local and some are from far away places. The one thing they all have in common is, they're all created with a love of all things fine and all things food. When the weather turns cooler I start thinking about braising, and cooking with wine. Instinctively I turn to my French cookbooks, as I love French cuisine, particularly the classics. For me, there’s no better food, when done well. I’ve cooked my way through Elizabeth David’s books; French Provincial and French Country Cooking amongst them, and still refer to them constantly. Her recipes are deliciously simple, and she always treated food with such reverence, understanding, and above all care. Paul Bocuse – The New Cuisine, is another favourite. It was the first cookbook my husband bought me, for our first Christmas together, and again, part of my education as a cook. I’ve cooked and cooked, and have had many triumphs and disasters, and eventually when all this knowledge sinks in, you start to do things your way, breaking rules, and developing your own style. We as a family have always enjoyed boeuf à la bourguignonne. Love it in fact! It’s a pretty fine stew. I don’t use any particular recipe these days, and the recipe below is not a classic bourguignonne, but it’s one we enjoy and keep coming back to. The strip of orange peel that I add gives this it a little freshness, and somehow lightens what is a rich and satisfying dish. Use a mix of mushrooms if you like, and resist the temptation to serve this with a creamy mash. Instead, boil potatoes with a couple of cloves of garlic, and put them through a potato ricer when cooked; this also helps lighten what can be for some a very rich dish. There is no need to add butter or cream, just a drizzle of excellent olive oil will do, and enjoy this yummy stew on a cold, rainy winters night with a glass or two of pinot, with the ones you love. Put the beef cheeks in a large bowl. Add the orange peel, carrot, onions, garlic, bay leaves, rosemary, thyme and parsley. Pour over the wine, cover, and refrigerate overnight. Preheat oven to 140C and remove the beef from the marinade. Pat dry with kitchen paper. Drain the vegetables and herbs, reserving the wine. Season the beef with salt and pepper. In a large casserole, like a Le Creuset, heat 2tbsp olive oil and 2tbsp butter over a medium heat and brown the beef cheeks on all sides. Add the reserved marinade ingredients except for the wine and cook for about 3 minutes. Add the wine and chicken stock to cover, bring to a simmer and cover with a sheet of crumpled baking paper. Put on the lid, and place in the preheated oven for 3 hours. Have a look after 2 hours, if the cooking liquid is simmering rapidly, turn down the oven to 130C. Meanwhile, put the lardons into a small saucepan, cover with cold water, and bring to a boil. Drain, and pat dry. Now, heat a fry pan over medium heat, add 1tbs olive oil, and fry your lardons until they are nice and crisp. Remove from pan and drain on kitchen paper. In the same pan, add the remaining 1tbsp butter and fry the mushrooms over a high heat until brown. Remove from pan and drain on kitchen paper. 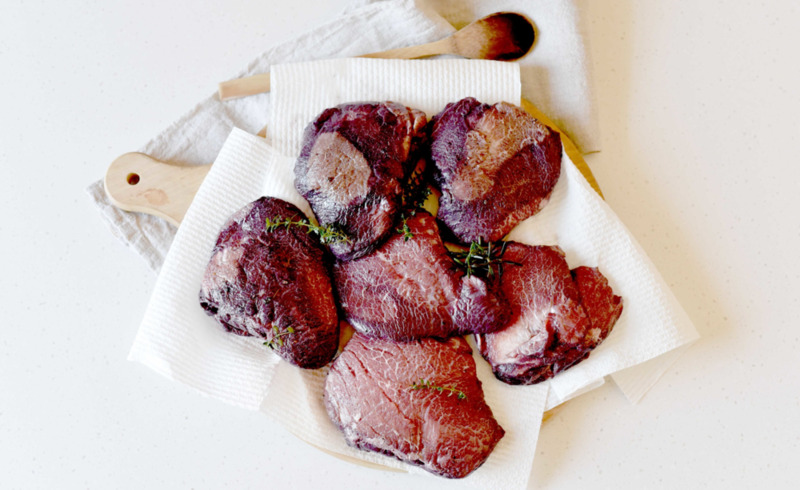 When the beef cheeks are cooked, remove from oven and gently lift them out and place in a bowl. Leave vegetables and herbs behind. Now bring the cooking liquid to a boil, and reduce until it starts to thicken. I like to skim off any grey scum that rises to the surface, as getting rid of it makes for a clearer sauce. When the liquid has reduced and is starting to thicken, turn off the heat, and put the whole lot through a sieve into a bowl pressing hard on the solids. Return to the casserole with beef cheeks, mushrooms and lardons. Reheat, taste for seasonings, add parsley and serve hot.